Ever since he was first announced as part of the Captain America: Civil War cast, many fans have wondered who The Hobbit: An Unexpected Journey star Martin Freeman is playing in this first Marvel Phase 3 adventure. The secret has finally been revealed. He is officially confirmed to be playing Everett Ross. The news was revealed in the latest issue of Empire Magazine. They have quite an extensive behind-the-scenes account from the set of Captain America: Civil War. Earlier today, they released a bunch of new photos showing an unmasked Chadwick Boseman as T'Challa, Elizabeth Olsen as Scarlet Witch, and a fresh look at Frank Grillo in his Crossbones costume. 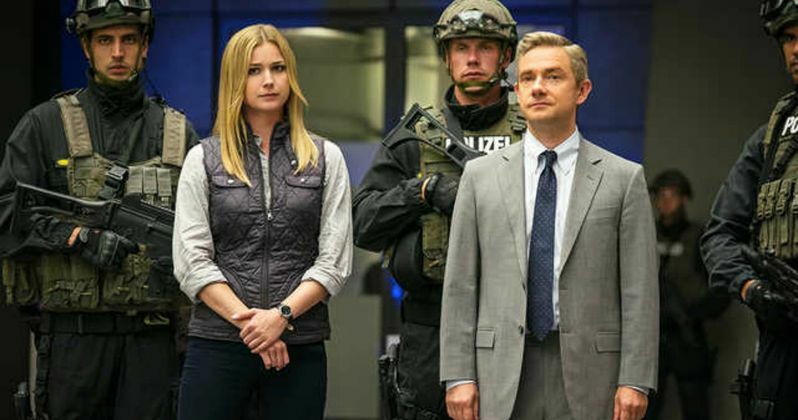 Now, we get a new image featuring Martin Freeman as Everett Ross. Also included in this latest sneak peek Is Emily VanCamp as Sharon Carter, Steve Roger's former neighbor and possible new love interest. If you look closely, you'll notice that Carter and Ross are getting some much needed backup from a group of German S.W.A.T. soldiers. Co-director Joe Russo explains that the movie is heading to Germany, where it will bring Steve's journey full circle. In Captain America: Civil War, Chris Evans' iconic hero is going back to where it all began. And it will undoubtedly be a very emotional journey for him. Everett Ross will be there, standing behind him. The character is a Marvel comic book stalwart with ties to Wakanda. He is traditionally considered the U.S. government's primary authority on Black Panther's home. And it has been rumored that Ross will show back up in T'Challa's standalone adventure. Everett Ross is new to the MCU, and will first be introduced in Captain America: Civil War as part of the Joint Counter Terrorist Centre. This organization is attempting to keep Cap, Iron Man and their other superhero pals in check. The latest issue of Empire Magazine promises to bring even more insight into the character and his place in this story. Until you're able to get your hands on a copy, feast your eyes on Ross, Carter and the German S.W.A.T. team that will be accompanying Steve in his trip to the land of bratwursts and beer gardens.